This is the best photo of Henrietta that I have. There seem to be no good ones. Note: * The date of Sept 1848 for Henrietta's birth comes from the free BMd index for Yeovil as reported by Ron Walker (see email dated 10 Feb 2016). However a date of 14 July 1849 was given to me by Ray Farnsworth. I also have a date of 1847 from an unnamed source handed down to me from my father. The 1881 Alnwick census (kindly sent to me by Ray Farnsworth) shows her aged 31 in that year (implying that she was born in 1850). In an email dated 9th July 2005, Ray Farnsworth reported that on her marriage certificate Henrietta is stated to be a "minor", implying that she was less than 21 years - i.e. born after Apr 1846. See notes under Henry Augustus Paynter relating to the inter-relationship between the Newmans and Paynters..
Only daughter and youngest of 12 children of the solicitor, Edwin Newman of Yeovil. 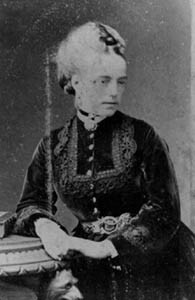 At the age of 17, on 11th April 1867 at St George's Church in Hanover Square, London, she married Henry Augustus Paynter, son of Edwin's partner in the firm of solicitors, Newman Paynter & Co. These details are confirmed by Ray Farnsworth who has a copy of the marriage certificate (see email dated 9th July 2005). It remains a mystery as to why Henrietta and her husband Henry chose to live in the northest corner of England, as far from their families as it was possible to go. In the view of Henry's great-grandson Hap (Henry) Paynter, the couple's decision to live so far away may have simply been to escape from oppressive home environments. According to their marriage certificate, Henry was already living in Alnwick at the time of their marriage where presumably he had been found a position in a local law firm. Their first child, Katie, was born in the nearby coastal village of Alnmouth on Feb 6 1868, just 10 months after their marriage. 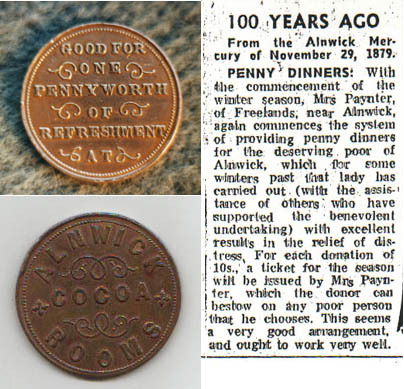 Later the same year, Edwin himself travelled to Alnwick, where, in November 1868, he attended an auction at the Swan Hotel in the centre of town and purchased Freelands for the sum of £2300 after it had been passed in at auction, granting use of the estate to his son-in-law Henry. 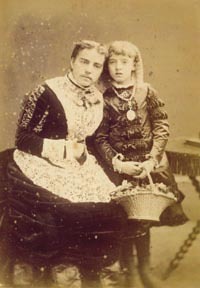 The couple lived the rest of their married life at Freelands, where Henrietta gave birth to 11 more children over a period of 32 years. She married at 17, bore her first child at 18 and her last child at 45! My father remembered her in his "Reminiscences" of Alnwick as being "..... as dumpy as her husband was tall, her voice a shrill croak .... . She contracted diabetes before the insulin treatment had been discovered, when strict diet was all that medicine could offer, and she died of it in 1914. It was rumoured that Henry then suffered pangs of guilt for the excessive child births he had imposed upon her". Edith had somewhat kinder words to write about her mother in her reminiscences of 1974: "Mother was always trying to help people. One very hard winter, she opened a soup kitchen and poor people would come and get soup or cocoa, and they gave counterfoils for it. Mother must have had these made as I knew these were given for the counterfoils and not for money. She started a laundry for orphan girls; the Duchess (of Northumberland) took this on and made the girls wear uniforms which Mother thought was a shame". In contrast, Edith added the comment that "my mother had children so quickly, about 5 in the first 8 years. I don't think she was particularly fond of children but was well enough off to keep a Nanny and a nursery at the back of the house". She went on to write" My Mother was a very good horsewoman, and used to ride in Hyde Park. When she was a girl, she lived in a house overlooking Hyde Park. That was before she was married, but after that Mother was always adding to the size of her family". [Note: I speculate that her father, Edwin Newman, owned a house at 19 Bolton Street, Mayfair (off Picadilly). 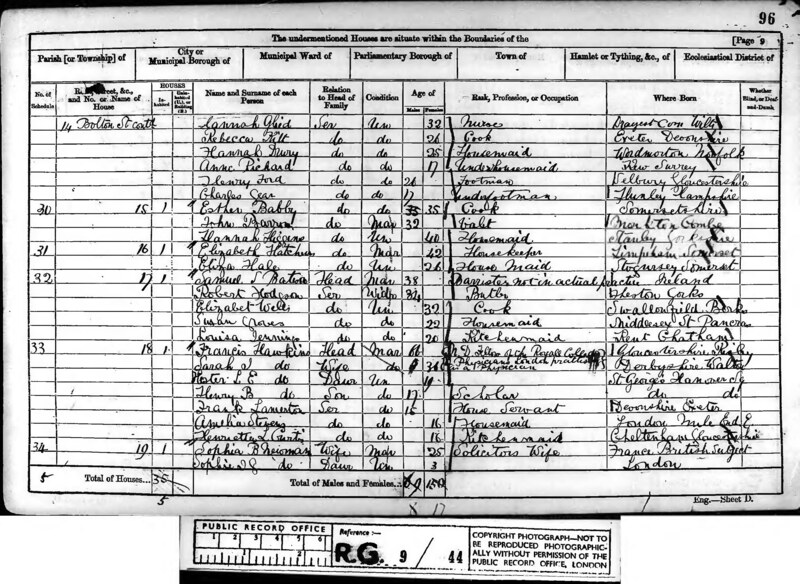 I base this on the fact that his eldest son Edwin's family was living in the property at the time of the 1861 census, and it is not unlikely that Edwin would have allowed his eldest son to settle his young family when he began working in London. 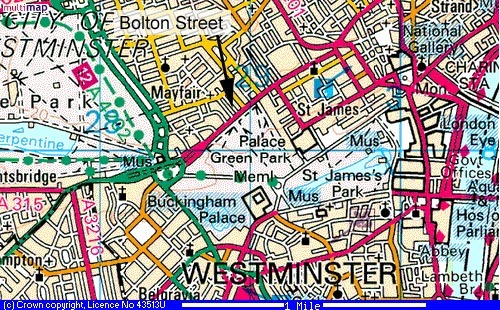 Bolton Street does not overlook Hyde Park, but it is less than half a mile from it (see map). Caring for the under-classes seems to have been an important part of Henrietta's life. Besides the soup kitchen and laundry, Edith goes on to write "Mother felt the fisherman (at the nearby seaside village of Alnmouth) had nowhere to go except the Public House, so she decided to rent a house overlooking the harbour and put a caretaker in, and provided free notepaper, newspapers and magazines, tea to drink, and there were fires. I was not happy about this as Mother had to write to friends and people to help to get the money to run it. She took lots of things out of Freelands for this place. I do not think Father was consulted. Our billiard table went there, and bookcases, chairs and all sorts of things. I think she was the pioneer of Fishermen's Clubs". 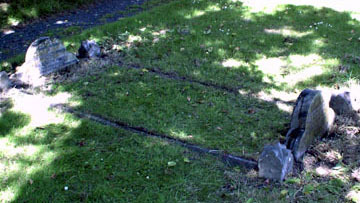 Henrietta died in 1914 and is buried in the churchyard at Alnwick where her headstone can be found (photos below, courtesy Ray Farnsworth). Ray says that the grave is located about half way down the cemetery drive on the right side, about 3 or 4 graves in from the road. It is opposite the water tap which is on the left of the road. 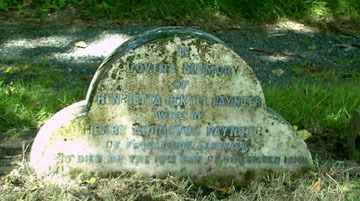 The foot-stone is a stone for her son Frederick Paynter. The side stones (now lowered a bit to permit grass cutting across the grave) record that husband Henry died in 1919 and is buried at Lufton. Marion Paynter told me (in 2001) that Henrietta's sons Ernest and Jum trained as lawyers but were made to work for their father for nothing, revolted and "fled to freedom" in Canada. She adds that according to Jum, Henry and Henrietta argued incessently about money - and that suitors visiting the girls had no idea of the parlous state of the family's finances. Henrietta never had enough money for housekeeping or for the entertaining that they did, nor for the charities that she supported. Last Updated: 22nd Feb 2016 - date of Henrietta's birth changed as per information from Ron Walker - see note *.